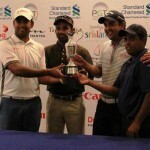 Pro Golf (Pvt) Ltd. promoted, organized & managed the first ever major Professional Golf Tournament in Sri Lanka. So far we have organized and managed four major professional golf events in Sri Lanka and many more events to happen in coming years. Tata Housing Celebrating Srilankan Independence Tata Housing Development Company is a key player in real estate development in India. Tata housing is now venturing to Sri Lanka with real estate township projects in Colombo. Dialog Classic Stableford Golf TournamentThe Dialog Classic Stableford Golf Tournament-2013 was held recently at the RCGC with 216 participants (108 teams) in contention. PGTI debuts in Sri Lanka with Standard Chartered Open 2012The Standard Chartered Open 2012 sets the stage for the Professional Golf Tour of India’s (PGTI) debut event in Sri Lanka at the Royal Colombo Golf Club.